On the strength of testmy.net statistics I have mnade an enquiry into my slow throughput via my ISP. They ahve sent an Engineer to test my line and everything checks out 100%. I showed the engineer a speed test done with TMN (Which he hadn't heard of) and it was 1.9mbps downstream. My line synchronisation with the exchange is 7400Kbps downstream and, if one does a speed test with the British Telecom speed test site we get 4.79Mbps! So, my question is, how do I convince the ISP to rely on TMN stats and not the wholesellers personal site? I produced some figures for the engineer, printed from the TMN history which clearly show that my transfer speeds were very good previously, i.e. between 5 and 6 Mbps normally but it's obviously easier for the British Telecom engineer to believe his own employers test site. I attached screenshots. You can clearly see that your speed has dropped recently. You've tested to Amsterdam, Texas and Multithread. Best you're getting is ~5Mbps. 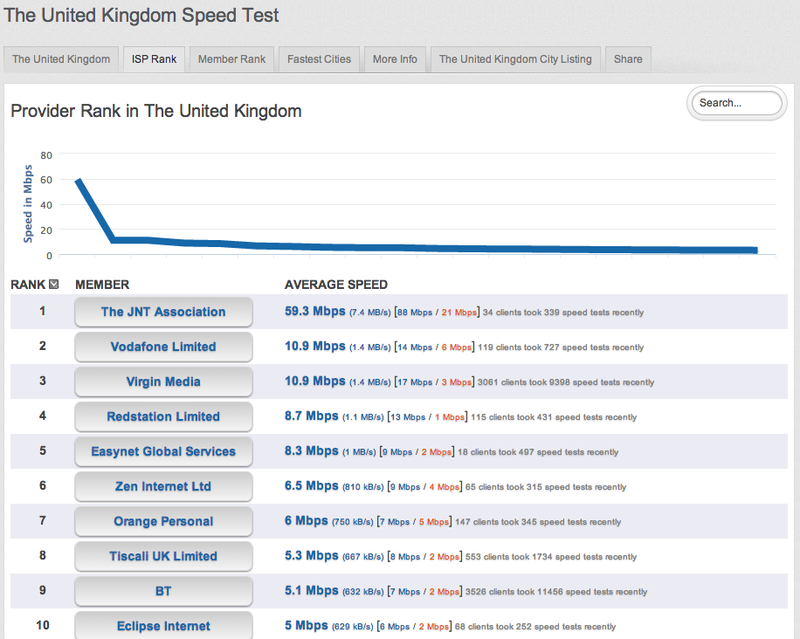 There's a discrepancy between TMN and BT's speed test because they work differently. I'll just say this... who do you think the telephone company's speed test is made to benefit? TestMy.net is a third party and my servers are hosted outside of your ISPs network... just as all the sites you visit are. The fact is, usually it's congested oversold peering at fault. Your ISP wants you to test with routing taken out of the equation so their test servers are within their network. You have the right to a third party opinion. You've been testing at TestMy.net for a while, you have gathered a good amount of data using various testing methods. From what I see... your connection isn't running as good as it what. And I don't care what the DSL guys say... they want you to believe that it's beyond their control and a fault of the sites and services you use. It's not. They choose their providers just like you do, if their lines are oversold or congested they should be buying more peers or switching their current ones. Instead... they count the money and pass the blame. The multithread test is a great connection test, not only can it help push a connection to the max but it also has the ability to test a bunch of routes at once. I can see in your stats that you're fully aware of that... you've tested using my CDN's and the closest servers and still can't do better than 5 Mbps. If you're supposed to have 7400 Kbps then you're getting 68%... but that's at best. You should get 80% at worst in my opinion. In your case you should get no less than ~ 6 Mbps. The classic single thread shows weakness. Same test, same server, same amount of data... multithread (as your ISPs test no doubt is) can easily mask issues. If your single thread performance is low streaming services and downloads will look much lower than the combined multithread performance. I did both tests from Colorado Springs, CO USA to Amsterdam, NL. ~5000 miles. 1/3 the speed in single thread at that distance... can you see how if you only saw the multithread result it might be misleading. ISPs want you to only see the combined efforts. 4 Mbps doesn't sound too bad, you should still be able to steam great quality in theory. But if your single threads are limited to a much lower speed that combined 4 Mbps doesn't help you much. Here's a topic that may help also... the same is true for most speed tests online right now with the obvious exception of TestMy.net. https://testmy.net/ipb/topic/28902-why-do-my-results-differ-from-speedtestnet-ookla-speed-tests/ -- trust me, your ISP hates me... but more and more are starting to work with people using TestMy.net results. TMN uses time tested methods that are proven... if your ISP wants to ignore facts then maybe you should shop around a little. Look at the ISP Rank tab on the stats page for your area. The United Kingdom for example, I'd probably look into VirginMedia. I ignored the first two because they aren't as popular (see #clients), others may be worth checking out too. ... I assume that your experience online feels slow otherwise you wouldn't be complaining to them. Your provider may or may not listen to my results but you can feel which test is right... your testing to a bunch of locations and ending up with subpar performance. It's not a coincidence, don't let them convince you that it is.